Written by Felipe Azenha & filed in Community, Development Pipeline, Events, Mixed-Use, Transit. The Center for Urban and Environmental Solutions at Florida Atlantic University & the Urban Land Institute’s Southeast Florida/Caribbean District Council are hosting this exclusive Academy. 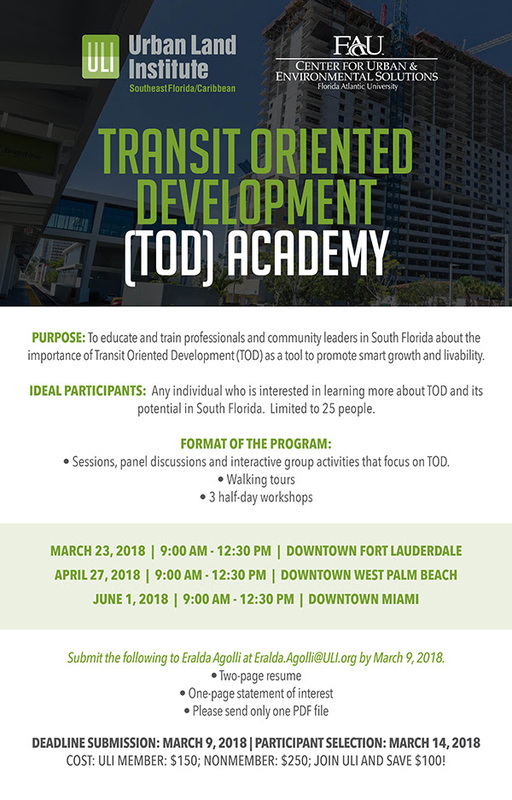 It is for any individual interested in learning more about TOD and its potential in South Florida. However, the academy is limited to just 25 people, who will be selected by the ULI Mobility Committee. The committee will review and select the inaugural class by March 14, 2018. If you’re interested in participating you must Submit the following to Eralda Agolli at Eralda.Agolli@ULI.org by March 9, 2018. Click here for even more details on this event.